One Step Checkout extension for Magento 2, developed by Mageplaza, is the best marketing tool which helps you to reduce your store abandonment cart, increase conversion rate and totally grow your store revenue. That extension helps customers checkout quickly and conveniently in one page with all six steps. Many outstanding plugins such as Ajax loading, Google address suggestion, Auto-update order information, Apply coupon on the checkout page, Support multi payment methods will improve your checkout page and make it more powerful and more effective. Mageplaza One Step Checkout for Magento 2 User Guide will provide the detailed instructions to know How to use on the frontend and How to Config on the backend. 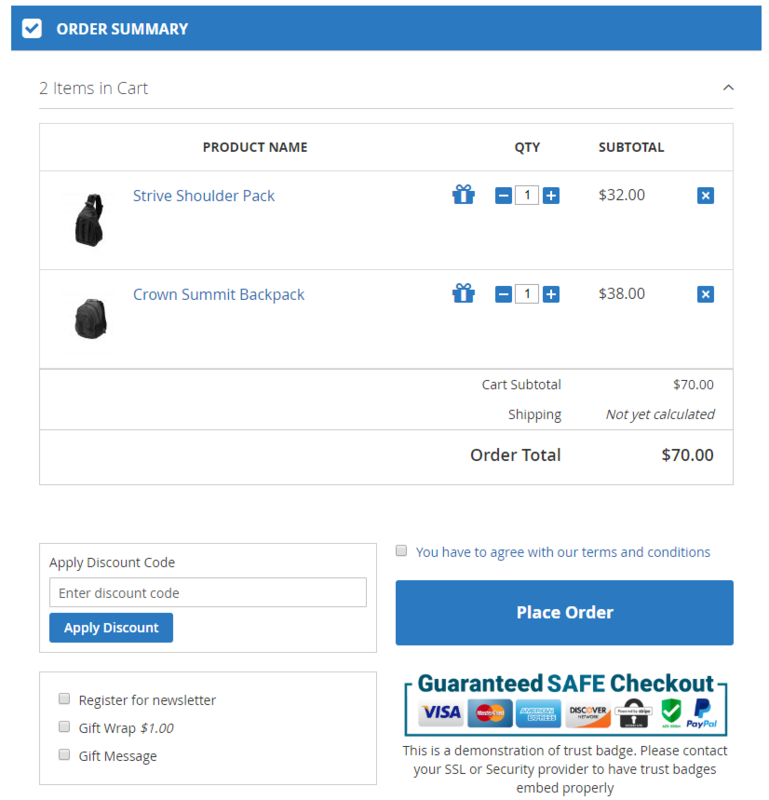 After adding the right products in the cart, the customer will be navigated to the checkout page. The checkout page will be shown with all six steps as the image below. 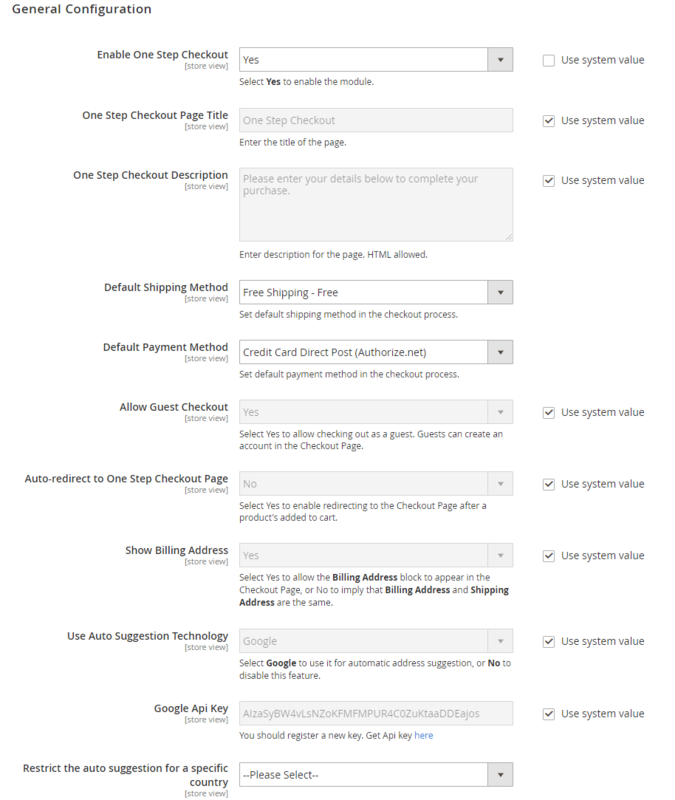 A one-step checkout will be totally done on one page only by completing information and selecting options. Customers enter their personal information into required fields (which are marked by a red *). In the box Street Address, One Step Checkout helps displayìng a list of addresses suggested automatically by typing only one letter. Furthermore, Country, City and State/Province will be consequently auto-updated based on the selected street address. Buyers can tick the box My billing and shipping address are the same to have their item(s) delivered to their billing address. 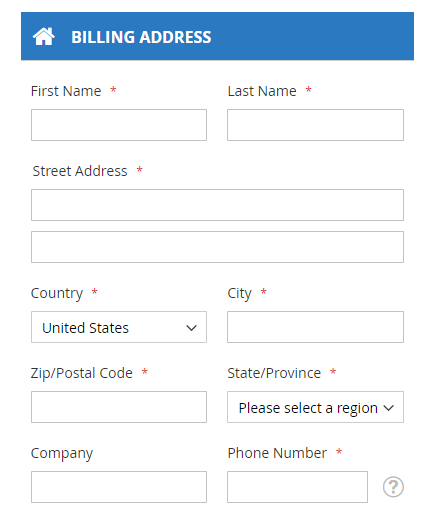 Otherwise, the Billing Address section allows buyers to fill in their information to check out. Depending on the configuration in the backend, the shipping method will be variable to meet customers’ requirements. Admin can add more other shipping methods at the backend Sale > Shipping Method. You can refer here for more information. Also, buyers can enter their house security code if it’s neccessary. One Step Checkout allows customers to quickly select their favorable payment method only by a single click. Admin can add more other payment methods at the backend Sale > Payment Method. You can refer here for more information. In the Order Review section, One Step Checkout allows buyers to easily adjust their item’s quantity by using the minus/plus button. 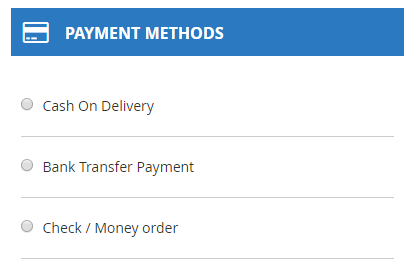 Subtotal, shipping fee, tax and grand total are displayed clearly by One Step Checkout. One Step Checkout enables customers to apply coupon in the Apply Discount Code box. The box Sign up for newsletter can be selected if customers desire to receive information from the online store via email. Customers may request the purchased product to be wrapped and send a gift message with that product. Terms and conditions will be displayed in a pop-up box and can be accepted by clicking on I agree with terms and conditions. 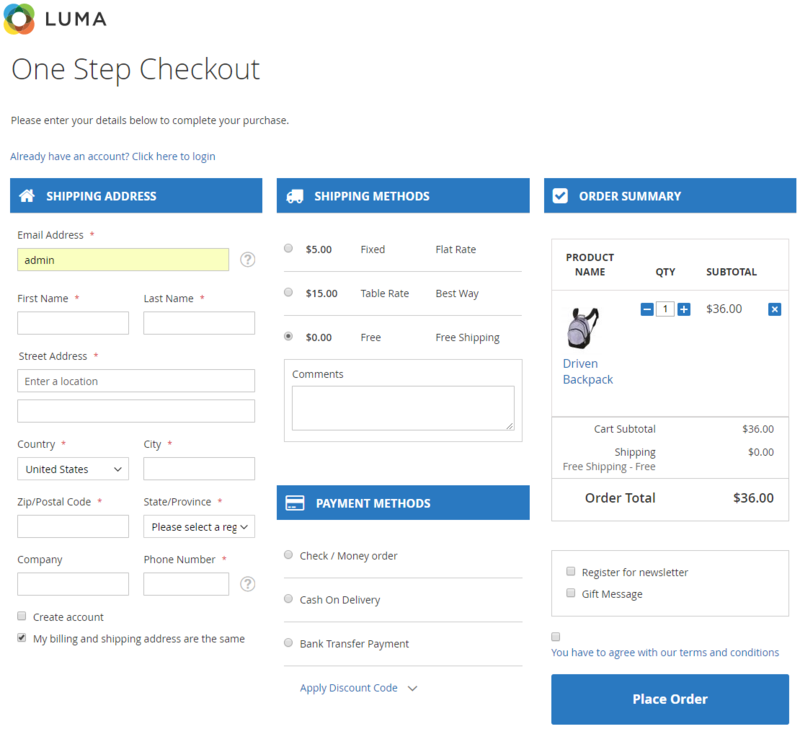 Eventually, the one step checkout can be finished by a click on the Place Order button. The whole process is completed in one page only. Seal block is displayed to make sure this is the official checkout page of the store, not forged. From the Admin Panel, go to Stores > One Step Checkout > Manage Fields. Drag and drop tabs from Available fields to Sorted fields to have them appeared in the checkout page. 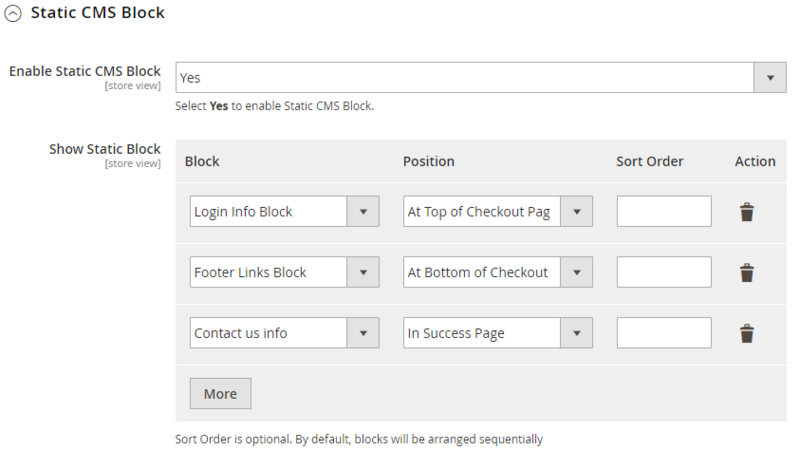 In the Enable One Step Checkout field: Select “Yes” to enable One Step Checkout extension. In the One Step Checkout Page Title field: Enter the page title you want. 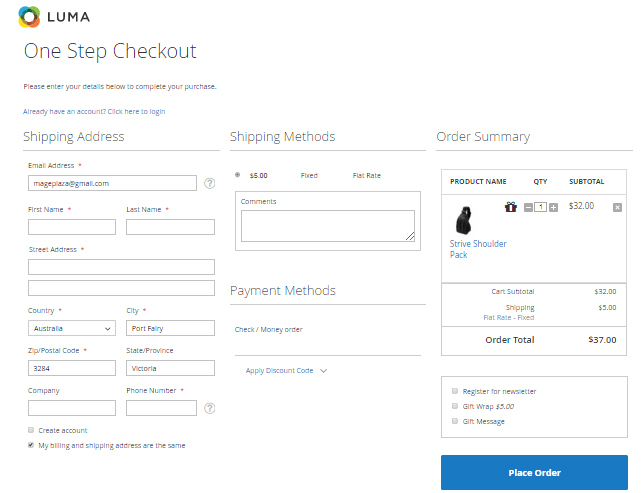 In the One Step Checkout Description field: Enter the short description to describe the One Step Checkout page. In the Default Shipping Method field: Set default shipping method in the checkout process. In the Default Payment Method field: Set default payment method in the checkout process. In the Allow Guest Checkout field: Select “Yes” to allow checking out as a guest. Also, guests can create an account on the checkout page. In the Show Billing Address field: Select “Yes” to allow shipping items to a different address from billing address. Google: if you select Google option, when the customer fills address fields, it will suggest a list of full addresses. In Google API Key field: Insert the Key. About how to get this key, you can refer this guide. 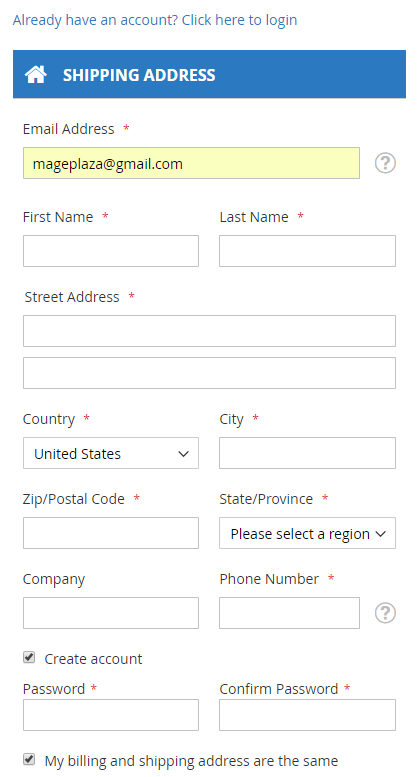 In Restrict the auto suggestion for a specific country field: Select default country for Billing address and Shipping address. In the Show Login Link field: Set “Yes” to show the Login link which allows the customer to sign in. Leave “No” to disable this link. Show/Hide Footer/Header: Depending on each theme that the checkout page will or will not display the Header/Footer of that page. Select “No” to hide Apply Discount Code box on the Checkout page. Select “In Payment Area” to display the Apply Discount Code box in the Payment Methods area. 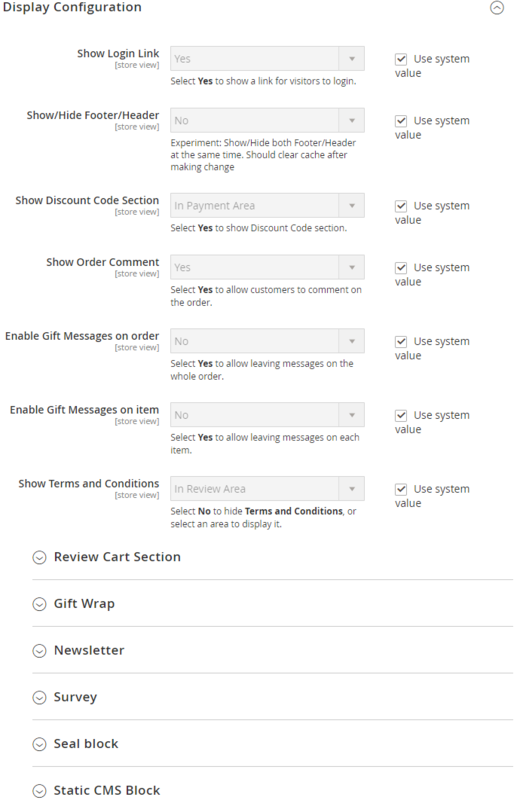 Select “In Review Area” to display the Apply Discount Code box in the Review Order area. In the Show Order Comment field: Select “Yes” to show the Order Comment box that allows the customer to enter their comment on the order. In the Enable Gift Message on order field: Select “Yes” to show the Gift Message box that allows the customer to enter their gift message. In the Show Terms and Conditions field: You can choose “No” to not display the Terms and Conditions OR select “YES” to display it in two different positions: In Payment Area and In Review Area. In the Show Order Review Section field: The Order Review is enabled by default, if you want to disable to review order, let select “Disabled” option. Calculate Method field, select Per Order or Per Item to calculate the gift wrap fee based on the item quantity or the order total. Comment box will be shown at the Shipping Method area. Select “Yes” if you want to show Sign up newsletter selection. Checked Newsletter by default will be displayed. Select “Yes” to keep this item be checked as always. Set “Yes” to allow store owner can issue a survey question to buyers when they placed order successfully, some additional fields will be expanded. Survey Answers: Store owners can offer multiple answer options to their customers. Each of an answer options are displayed as a checkbox, which means that customers can select multiple answers at a time. Allow Customer Add Other Option: Select “Yes” so that customers can make their own answers to survey questions. In the Place Order button color field: Choose the color for the place order button which should be a highlight to attract shoppers the most. 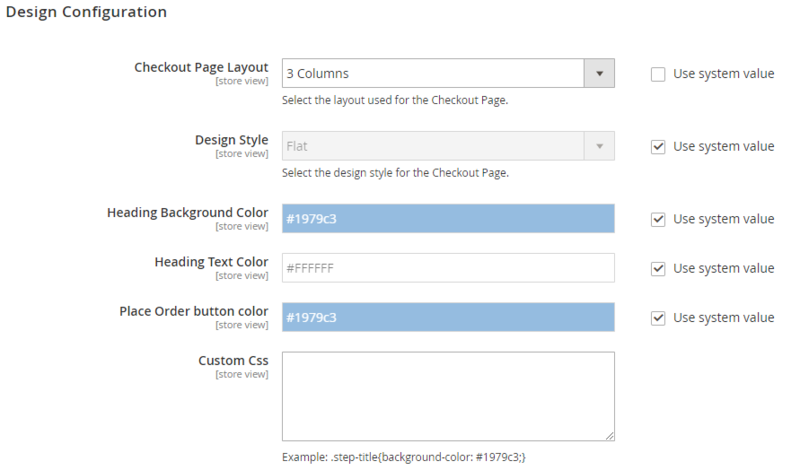 In the Custom CSS field: You can add the CSS code to custom your own style. GeoIP allows you to lookup the approximate location of an IP address. If store owners enable this function, when a customer comes to the checkout page, State, country, city and zip code will be automatically entered based on his current IP address. Ask customers fill less, they will buy yours more! Sometimes you can’t display some minor fields on the checkout page even you’ve enabled them in the backend configuration. Don’t worry that there’re no serious technical issue here, please follow those below instructions to display them properly. Term and Conditions hasn’t been created yet. Follow Admin > Stores > Settings > Terms and Conditions > Add New Condition to create a new form. You haven’t turn Term of Magento configuration on`yet. Please go to Stores > Settings > Configuration > Sales > Checkout > Checkout Options` , set Enable Terms and Conditions to “Yes”. Then, refer here to learn how to enable the Term and Conditions on the checkout page. When you enable this option but can’t see its icon on the frontend, you might not have allowed the product to have the message. Please log in to Catalog > Product, choose that product you want it to have gift message, enable this below option and save the product. 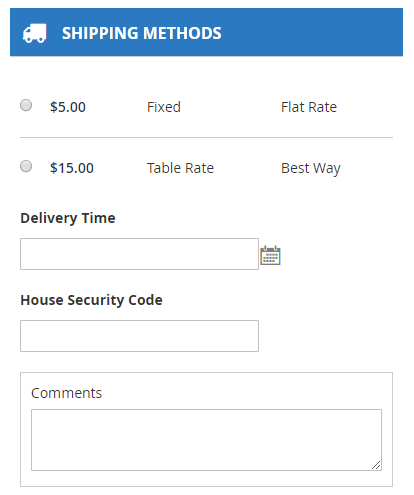 In general, Magento just displays two basic shipping methods are Flat Rate and Table Rates. To add another shipping method, go to Stores > Settings > Configuration, enter Sale > Shipping Method and follow this guide.